In March, 2018, Storm Emma and the so-called ‘Beast from the East’ wrecked Dún Laoghaire’s East Pier and brought Ireland to a standstill. The previous October, fifteen young sailors were rescued from Dún Laoghaire harbour when storm Brian and ex-hurricane Ophelia landed joined forces to create a lethal weather bomb. 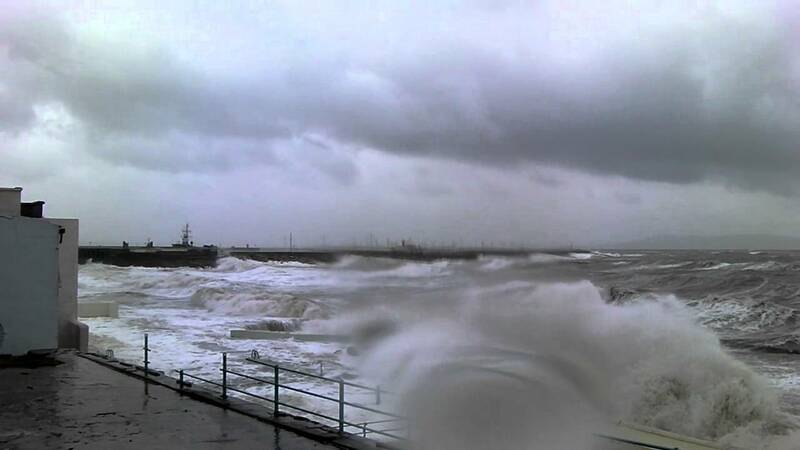 As I watched Emman’s enormous waves crash over the pier and flood the DART tracks at Seapoint, I remembered just how radically extreme weather has shaped and haunted Dún Laoghaire over the years like a monstrous phantom. Lest we ever forget, if it wasn’t for a fatal storm in November 1807, Dún Laoghaire’s iconic harbour might never have been built. Since the 5th century to the early 1800s, Dún Laoghaire was a small and sleepy fishing village around an inlet near where the Purty Kitchen pub stands today. The harbour changed everything. It directly led to the construction of the first commuter railway line in the world from Westland Row to Kingstown, which in turn led to development of the town we know and love today. In 1817, the population of Dún Laoghaire population numbered about 300. By 1860, it had mushroomed to 12,500. But before this growth there was tragedy. Nearly 400 people died in the Rochdale and Prince of Wales disasters. There was no harbour to take refuge, so the ill-fated vessels were left to their own devices during a blizzard and vicious storm. During the outcry that followed the disaster, a petition book opened in Monkstown church demanding the construction of an asylum harbour. It took years to get the project off the ground, but the foundation stone was laid on May 31, 1817, nearly a decade after hundreds of people died at Seapoint and Blackrock. The bi-centenary of this event was marked by President Michael D. Higgins the unveiling of a plaque by President Higgins at the end of May, 2017. President Michael D. Higgins, Councillor Corman Devlin and Harbour Company CEO, Gerry Dunne unveil a plaque and lay a time capsule to commemorate the bicentenary of Dún Laoghaire harbour. Christmas Eve, 1895, became another dark day as a storm described as “the most severe of the century” caused waves to crashed over the lighthouse. A Finnish ship, called the Palmé, got into difficulty. The lifeboat deployed to rescue it was destroyed with a single devastating wave and fifteen lifeboat men drowned. The harbour was littered with debris, wreckage and carnage. The funerals are said to be the largest Dún Laoghaire has ever seen and flags were lowered to half mast at ports across Europe. The victims, aged between 22 to 60, were buried in Deansgrange cemetery. At noon on Christmas Eve every year, a lone piper leads a procession down the pier and a short memorial ceremony takes place. The worst tragedy of them all occurred on November 10, 1918, when a German u-boat torpedoed the Leinster mail boat. The sinking of the Leinster and loss of 501 lives will be the key historical event commemorated by the state in 2018. More Irish people died on that ill-fated final voyage than on the Titanic or Lusitania. These are all terrible tragedies, but I’d like to conclude with an uplifting story about how a sea storm became a source of inspiration, and an creative epiphany that changed the course of literary history. Samuel Beckett grew up in Foxrock, near Dún Laoghaire. The locality greatly informed and inspired his work. There is a plaque dedicated to Beckett’s memory, and acknowledging his Nobel Prize for Literature accolade in 1969, on the lower section of the East pier under the weather station. The quotation “great granite rocks flying up in the light of the lighthouse and the wind-gauge spinning like a propeller, clear to me at last…” is from Beckett’s famous one-man play Krapp’s Last Tape written for Patrick Magee. While not as iconic or well known as Waiting for Godot, it is one of Beckett’s major works. Distinguished actors who have played Krapp over the years include Harold Pinter, John Hurt, Barry McGovern and Michael Gambon. The play concludes with one of the famous Beckett lines, which is a gloriously defiant and resilient statement, especially considering all the catastrophic loss of life and limb that Dún Laoghaire has witnessed over the years.